When it came to GI Joe, the cartoon was just a shadow play: the real story was in the comics. Larry Hama crafted some of the 1980s' finest adventure fiction in the pages of the Marvel comics, and gave fully involved histories to characters who would otherwise have been little more than ciphers. Take, for instance, the Crimson Guards, who were just fancy uniforms in the cartoon, but pretty much the backbone of Cobra in the comics. The Crimson Guard are the elite shock troops of the Cobra legions. All "Siegies" must hold a degree in either law or accounting and must be in top physical condition. Final stages of training take place in the deepest recesses of Cobra Headquarters and are purported to involve an initiation ceremony too hideous to describe. 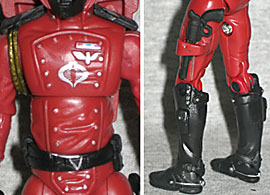 While most of the GI Joe 25th Anniversary figures' packages directly re-create the original toys' filecards, the G3 Crimson Guard is one of the exceptions. Yes, it has the same text as the most common version of the card, but that's not the first: apparently the prerequisites to be a Siegie (which is a corruption of "C.G.," in case you didn't get it) became more stringent over time, because originally the job description simply required that they be college graduates, not a lawyer or accountant. 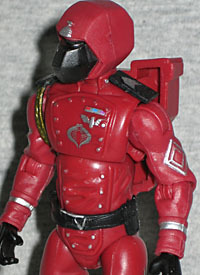 The Crimson Guards wore what was pretty much the most detailed uniform of any GI Joe figure when they were released in 1985. Of course, these days even the "simple" costumes get plenty of intricate detailing, so the CG isn't quite as much of a standout - but that doesn't mean he doesn't look good. The CG uniform looks pretty sharp with its classically military design. The knee-high black boots have pouches on the sides, decorative spurs on the heels, and a bit of protection on the ankles. There are twin silver stripes running up the outside of each leg, and two overlapping belts at the waist. The jacket has silver details: snaps, Cobra symbol, badges and medals. There's a large silver diamond on the left arm, and silver stripes near the wrists. His gloves and epaulets are black, and his shoulder cord is dark brown. Topping off the uniform is the Siegie's distinctive helmet. Just most of the Cobra personnel, the Crimson Guards' identity was obscured by a concealing mask - making them excellent army builders. The headgear has a strange shape that makes it look like a helmet and gasmask all in one, with an angular design that is like nothing used in the real world, and kind of makes him look like a chimp from the side. The Crimson Guard has a few updated accessories, such as the updated V-shaped backpack. It looks like a hardbody backpack, possibly even providing a bit of armor back there. The clasp is a Cobra symbol, because Cobra Commander is all about branding. The figure's main weapon is a nicely detailed machine gun with a serrated bayonet affixed to the end, but he also has an old-fashioned revolver on his hip. In 1985, that pistol was a sculpted part of the figure, while today it's its own piece. Ah, progress! Surprisingly, the Crimson Guard stands 4⅛" tall. The Generation 3 figures are already taller than their 3¾" forebears, but the CG is tall even by those standards. He's right up there with Roadblock, the tallest Joe of them all. No worries, though: it just makes him look like a more intimidating foe. Articulation is on par with the other TFAC and G3 figures, which means it's really good: balljointed ankles, double knees, balljointed hips, swivel wrists, balljointed elbows, balljointed shoulders, balljointed torso and balljointed head. In the world of GI Joe, the Crimson Guards were almost a force unto themselves. The elitest of the elite, the Siegies only rarely got their hands dirty with fighting: their skills were better suited to long-term infiltration, and pulling them out of cover for every dust-up would be a waste. Ask yourself, what's a more effective weapon: shooting color-coded lasers at the Joes as they try to invade your giant, snake-headed castle, or a senator's top aide convincing him to vote against a bill giving the Joes more funding? Yes, the Crimson Guards are still tough soldiers, but they're made even tougher by the fact that when they attack you, you might not ever know it.